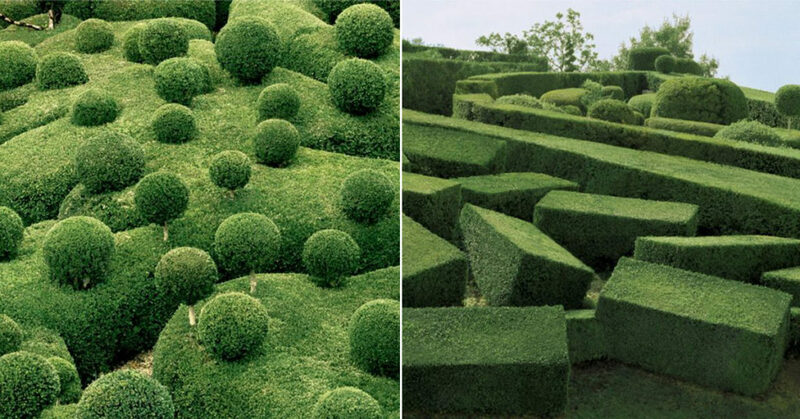 For this summer’s issue of PIN-UP, photographer Philippe Jarrigeon paid a visit to the Château de Marqueyssac in France to capture photographs of the beautiful, almost fictional-looking topiary gardens there. The property was originally developed by Bertrand Vernet de Marqueyssac in the 17th century, though it did not truly take form until the 1860s when owner Julien de Cervel decided to plant thousands of malleable boxwood trees and have them cut into a variety of fantastic shapes. During the second half of the 20th century, the house was not being frequented and thus, the gardens were no longer maintained. Fortunately, a new owner, Kleber Rossillon, restored the gardens to their former glory in 1996, as well as added some new features such as cascading waterways and alleyways of rosemary and santolina. The gardens now house over 150,000 trees that have been carefully carved into astonishing geometric patterns, all of which can be explored along the 5 kilometers of public walkable paths.